Project kit comes as components to be soldered to the included PCB. It's not a difficult project, about 30-45 minutes with a soldering iron. Even beginners can make it! 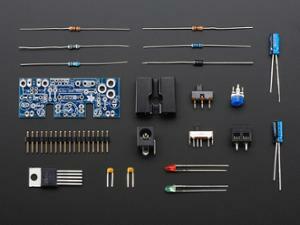 You'll need a soldering iron, solder, diagonal cutters and a PCB holder such as a helping hand tool. Breadboard and battery clip or DC power supply is not included, you can use any DC power supply with 2.1mm plug (we have a nice one in the shop).